Washington State’s 2014 Legislative Session began on Monday, January 13, 2014 and will continue through its 60th and last day on Thursday, March 13, 2014. It’s a short one, Friends. And this is one of the many reasons why your voice needs to be heard in Olympia today, tomorrow, and throughout this Legislative Session. 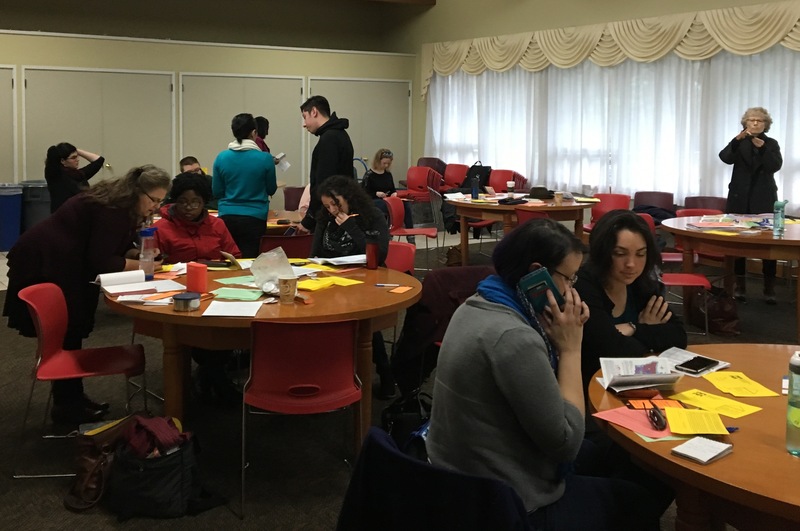 At the Coalition’s Homelessness Advocacy 101 workshops this past Saturday, two Legislative Aides shared with us the “secret” to getting heard in Olympia: tell Legislators that you care, a simple message about why you care, and do it in a way that’s easiest for you. Nancy Amidei, cheerleader for democracy and our Guest Presenter at the workshops, echoed that sentiment, saying that one doesn’t have to be an expert or have a Ph.D. to be an advocate. A simple message can make a big impact. 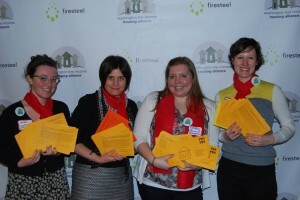 Here are Nina, Maggie, Kathryn, and me (Rebecca) holding hundreds of to-be-delivered advocacy postcards at #HHAD2014. Whether you want to send an advocacy postcard, e-mail your Legislators, leave a message through the Legislative Hotline (1-800-562-6000), or head down to Olympia to meet in-person, your voice is valuable and needed. Communicate with your Legislators what you care about and why to ensure that Everyone Counts 365 days a year. The Washington State Senate released their proposed budget yesterday which, if enacted, would be devastating for housing and human services. Housing and Essential Needs (HEN) was cut by 50% and the Aged, Blind & Disabled (ABD) program, with the tiny cash benefit of $197 a month for people waiting for federal Social Security benefits, was completely eliminated. Working Connections Child Care – a program that helps low-income parents pay for child care – was cut by $180 million. In addition, advocates are concerned that there is a chance that neither the Senate nor the House will allocate funds for the Housing Trust Fund, our most powerful tool for creating affordable housing and good jobs across Washington. The Senate’s proposed budget is unacceptable. We need to let our senators know how we feel about this budget, which places heavy burdens on low income people. Yesterday, the Coalition’s Alison Eisinger was among several housing and homelessness advocates who went down to Olympia to deliver testimony on the importance of the programs that were cut in the Senate’s proposed budgets. Here are two strong testimonies from Greg Winter, Director of Whatcom Homeless Service Center in Bellingham, and from Ania Beszterda-Alyson, Community Engagement and Advocacy Manager with the Low Income Housing Institute. I’m here to ask you to support the Disability Lifeline programs – Housing & Essential Needs and Aged, Blind & Disabled. I’ve witnessed first hand how these programs have transformed the lives of Whatcom County residents who were extremely vulnerable. I understand that your budget released today eliminates ABD – this is a very bad idea. This program provides modest support for people who are disabled and applying for SSI. The state receives approximately $50 million in reimbursements from the Federal Government for the modest cash grant and this is $50 million that will no longer come to the state or this vulnerable population. I understand that these people will be eligible for HEN if they are homeless or at great risk of homelessness, but it appears that your budget doesn’t fund HEN at the same level and certainly doesn’t increase it to accommodate for this newly eligible population, which is much larger than the current HEN-eligible population. The usage of the HEN program is increasing each month in every county of the state and we need to grow this critical program not shrink it and add more demand to it. Please reconsider your budget proposal and don’t leave these vulnerable people with nothing. Otherwise, many of these people will eventually show up in much more expensive, publicly funded systems of emergency care. Mr. Chair and members of the committee, my name is Ania Beszterda-Alyson and I am here to urge you to preserve the Housing and Essential Needs /Aged Blind Disabled program in its current form, and protect Washington’s most vulnerable residents. 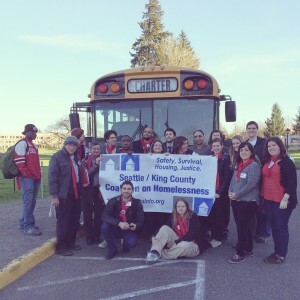 The Low Income Housing Institute works to end homelessness in six counties across Puget Sound by developing and providing affordable homes to nearly 4,000 low income, homeless and formerly homeless people, including over 700 families. Overall, 72% of units developed by LIHI are occupied by formerly homeless households. 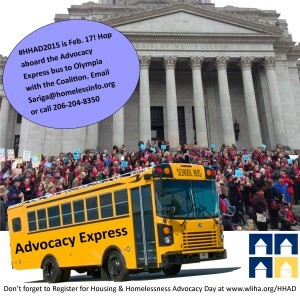 I drove to Olympia today to share a story of one of our residents who gave me permission to relay to you just how vital the Housing and Essential Needs Program has been for him. Due to his circumstance he preferred not to appear in person or have his name shared. I will call him Will. Will became homeless when he turned 18 as do so many of our foster kids (I’m a foster mom myself and find this heartbreaking). Will’s biological family abused him when he was very young, but an older couple took him in and fostered Will until he was 18. He still visits his two foster parents regularly and affectionately calls them grandma & grandpa. Being homeless was particularly traumatic for Will due to his childhood experiences, but also because youth easily become victims once on the streets and are abused terribly. After two years of living in youth shelters and outside Will’s case manager helped him secure a HEN voucher so he could move into one of LIHI’s apartment buildings – Gossett Place in the University District. Will qualified for HEN because he was homeless and he has a developmental disability. Just last month he heard that his SSDI was finally approved after two attempts with help of a lawyer. Thankfully he will continue to be able to live at Gossett Place where he’s been thriving thanks to the on-site case management, counseling and services. Staff at Gossett Place have commented that Will’s behavior has improved dramatically since he moved in 10 months ago and has become very stable. Will is now looking forward to working towards his GED; he volunteers at Gossett Place – helps to tend to the rooftop garden boxes, and hopes to begin training to become a barber. HEN truly was a lifeline for Will – it secured his housing while he waited for the SSDI payments to be approved and allowed him to escape the trauma he experienced on the streets as a vulnerable youth. Please protect the Housing and Essential Needs and the Aged Blind Disabled Programs and fund them at the current $130M level as they are a true lifeline for our state’s most vulnerable residents like Will. Thank you for your time.